Using our chart from yesterday, I went back over the Eagles draft history from the sample time period and separated the “inefficient” picks from the “efficient” ones. Note: After reviewing the chart, I made one change, taking the 4th round WR selection out of the “inefficient” category. – Overall, there are 3310 players included in this analysis. League-wide, just over 42% of these are considered sub-optimal/inefficient picks by our chart. 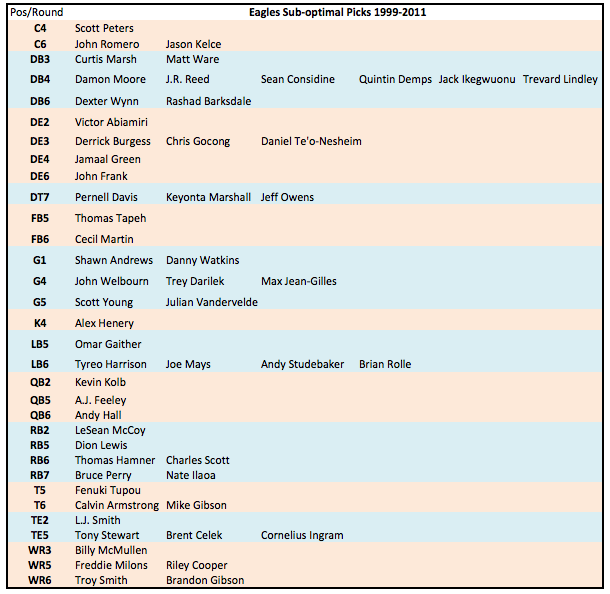 – Exactly 50% of Eagles draft choices from 1999-2011 graded as sub-optimal. Up until now, this has been a largely abstract discussion, but it’s about to get real. Below is a chart of all of the Eagles inefficient draft picks by our standards. Look on in dismay… Unfortunately, since the Eagles are part of the sample, we can’t really say the team would have been better off if they had never made any of these picks, but it sure seems like that’s the case (it’s an all or nothing decision to use the strategy, so you can’t pick out Shady and Celek and give back the rest). Remember that I’m not saying all of these are BAD choices, just that for the team to make them, it should have had extremely strong support for why each player was better than the rest of the prospects at his position group. I’m guessing that the Eagles, for the most part, did not apply that standard…though Shady does seem like he may fit that description as I recall him being rated significantly higher than any other RB at the time. Given a do-over, how many of those picks would you still make? Also, it sheds some light on supposed draft “steals”. For example, we can all agree that Brent Celek was well worth a 5th round pick (in hindsight). But how much credit should the Eagles get for that selection? Using our sample, if you selected 3 TEs in the fifth round at random, you would have a roughly 39% chance of finding a “starter” (1-(.85^3)). Not fantastic odds, but pretty good. So was Celek skill or just the result of the overall odds given that the Eagles tried three times to find a TE in the 5th round? P.S. I forgot to note yesterday that ZERO out of 54 DTs taken in the 7th round from 1999-2011 became starters. The Eagles selected 3 such players. I know I mentioned yesterday that I would discuss the whole Talent vs. Need philosophy, but I’m going to wait until I can add some more data to the discussion.